Using your Internet connection as a telephone system is an increasingly popular notion. There are public systems like Skype, of course, but you can actually use what is called “IP Telephony” to achieve much more than this, including running your entire switchboard system for a large office. 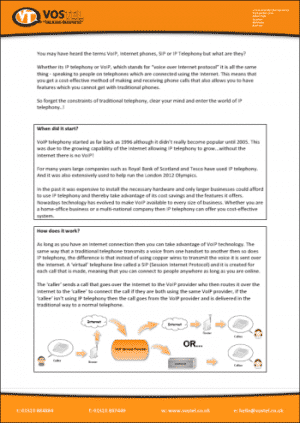 But what is IP Telephony and how can your business benefit from it? This free download is from my friends at Vostel, a leading telecommunications company specialising in IP Telephony. This report will help you work out how you can use IP Telephony within your business to achieve cost savings as well as productivity improvements. Listen too, to the people who run Vostel explain how IP Telephony can boost your business in my latest podcast.